Looking to Make an Affordable Home Upgrade? Maple Leaf has you Covered! We all love our homes, but most of us are constantly looking for ways to make them more comfortable and increase their resale value. Unfortunately, with so much month left at the end of the money, we have to find the best ways to get the most bank for our buck. Entrance Canopies-A metal canopy over your front door is a great way to make house guests feel welcome, and you will never again have to worry about fumbling around for your keys in the rain! Window Awnings-Awnings over your windows are a great way to add a real touch of class to your home, and they can also lead to significant energy savings! Patio covers-A covered patio is a great way to enjoy outdoor activities with your family and friends. 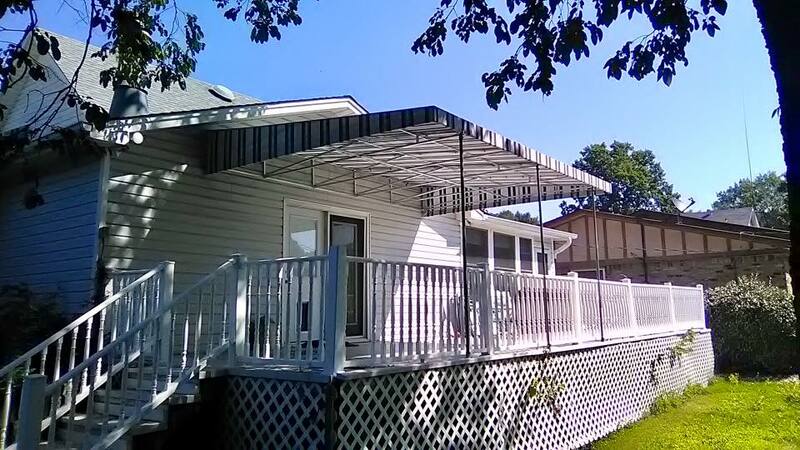 We can build durable metal patio covers that will attach seamlessly to your home, and you’ll be able to spend time in your backyard rain or shine. Retractable Awnings-Many of our residential clients enjoy the convenience and flexibility of our retractable awning products. They are built to order from Sunbrella fabric, which is available in hundreds of colors and patterns, and can be opened and closed in seconds at the touch of a button (or automatically). This entry was posted	on Thursday, August 23rd, 2018 at 9:45 am	and is filed under News & Updates. You can follow any responses to this entry through the RSS 2.0 feed. Both comments and pings are currently closed.